Great News! We are very happy to announce that one of the popular bus operator, GJG Express has joined us and become part of BusOnlineTicket.com! From this point onward, everyone can enjoy the convenience of 24/7 online access to book your GJG Express bus ticket at BusOnlineTicket.com. GJG Express is one of the popular bus operator headquartered in Penang, Malaysia. GJG Express is an express bus service provider specializing in bus from Kuala Lumpur to Butterworth, Kuala Lumpur to Penang, Genting Highlands to Butterworth and Genting Highlands to Penang. All the buses deployed by GJG Express are equipped with air-conditioner, spacious seat and legroom to ensure passengers can have a comfortable and secure bus journey. The most popular bus routes provided to GJG Express include bus from Kuala Lumpur to Butterworth and Kuala Lumpur to Penang. GJG Express offers convenient pick up in Kuala Lumpur which is located at the main transportation hub in Kuala Lumpur known as Terminal Bersepadu Selatan (TBS). The price from Kuala Lumpur to Butterworth and Penang is affordably costs from RM35 per way. Calling all the street food lovers! Are you planning to travel to one of the Asia’s best street food destinations? 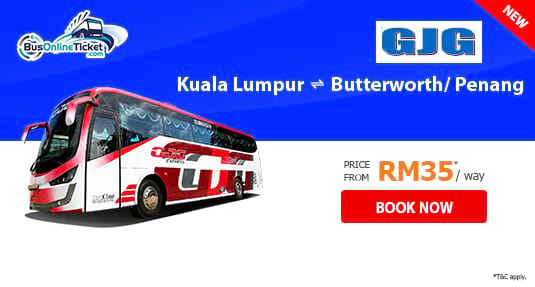 You can book your bus ticket from Kuala Lumpur to Butterworth and Penang online at BusOnlineTicket.com now and travel with GJG Express. Instant email confirmation will be sent to you once the payment is received.